Offering the ultimate in immersive and expanded simulation training, the "EX" projects up to 33 feet wide and incorporates a Gullwing 180-degree mobile screen system. Please note the Training Lab EX is NOT part of the popular Gunfighter series. It is a separate product designed for the customer looking to offer elite level training. It is not ideal for the customer just looking for entertainment. The Training Lab Ex gives you the best of both worlds of simulated training. Utilizing the screen when “flat” allows for traditional training where all the action is in front of the shooter. Or pull the side screens in for “peripheral” training, where the shooter must focus their attention on potential threats on all sides. No matter what your training objectives are, the Training Lab EX system can accommodate them. 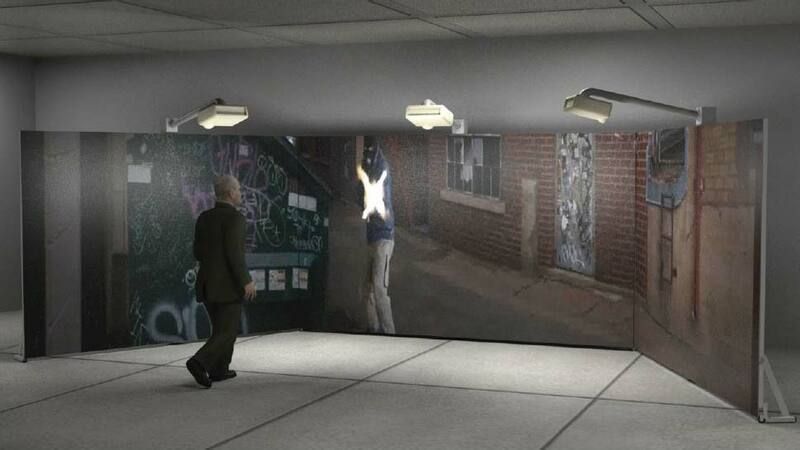 Mobility and real-life simulations are invaluable for enhancing Use Of Force training by incorporating relevant and realistic scenarios for shooters. 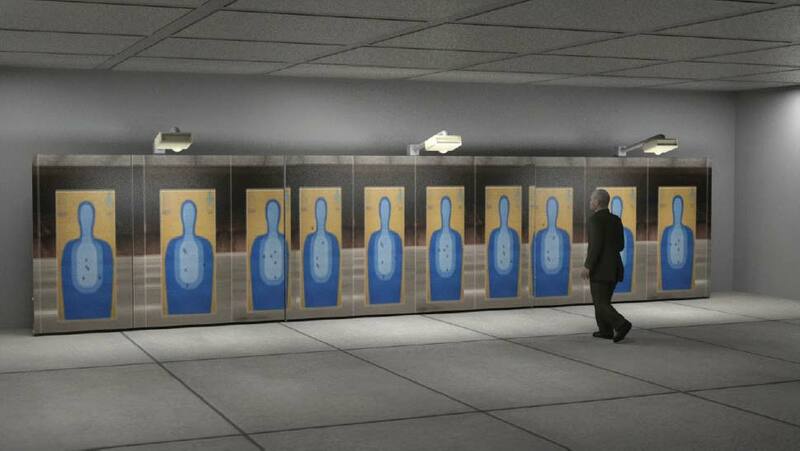 In addition, the Training Lab EX allows personal protection professionals to invest their time in a safe environment that is more cost-effective than the pricey ammunition at a traditional facility. 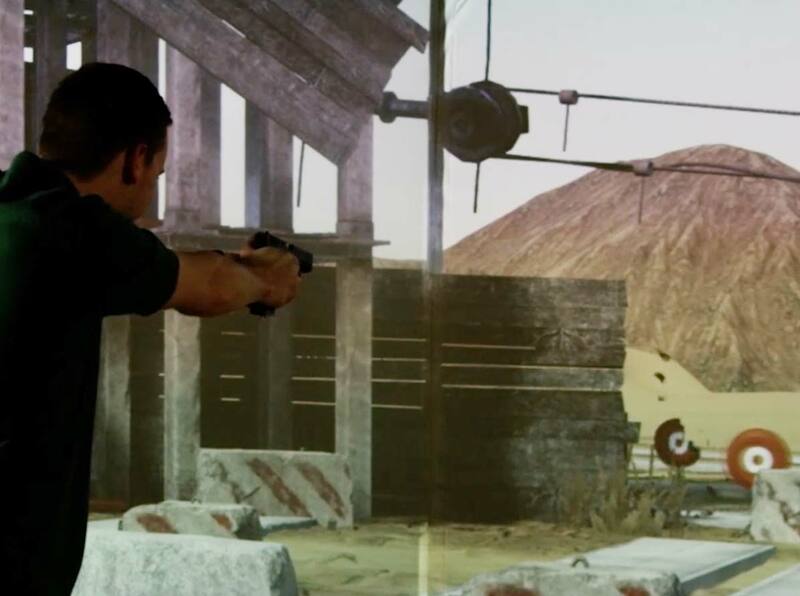 With the addition of the Firing Line / Virtual Marksmanship Software (optional) you have the ability to fully customize your own firing range with up to 10 lanes. Plus, with a quick and easy adjustment, you can switch to a 180 degree judgment training scenario within an entirely immersive environment. Firing Line software shown above. With the Gullwing configuration, you simply close the sides to maximize your training objectives. From up to 33 feet wide in the open position to 180 degrees closed - the system stays completely calibrated and can be moved easily and instantly to incorporate a vastly expanded array of virtual training options seamlessly. 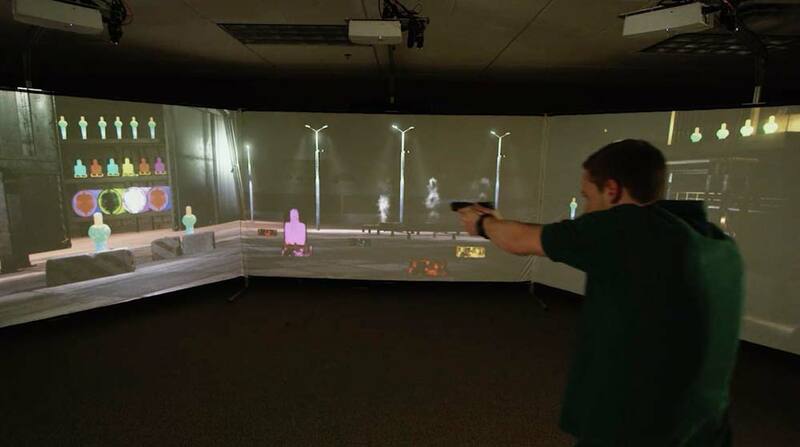 With Training Lab EX, shooters gain Use of Force training in a safe and controlled virtual environment. It also provides a practical evaluation of shooting competency that leads to higher likelihood of knowledge retention. This type of marksmanship training naturally improves the proficiency of shooters by combining firearm control with a cognitive processing environment. Simulation training provides the perfect opportunity for serious shooters to hone their skills, gain familiarity with a variety of weapons, and sharpen their judgment competencies in a safe environment. It always stays calibrated when the wings are moved so you can quickly move through an array of scenarios and situations. 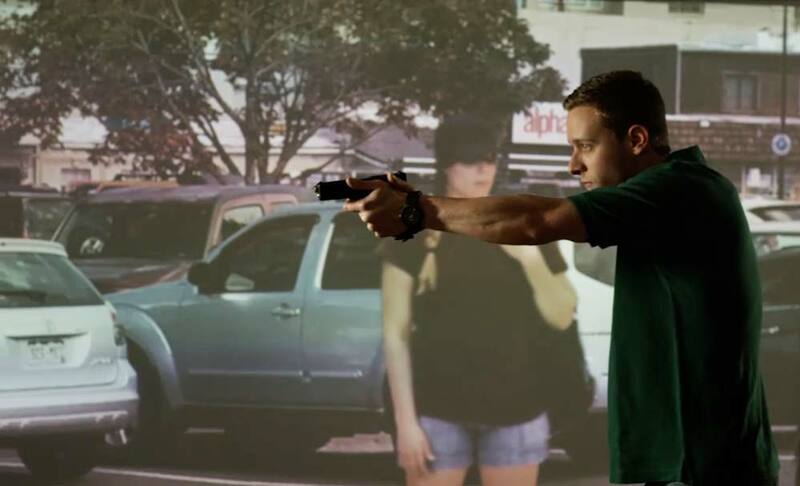 Trigger time has a direct correlation to better shooting, and while the Training Lab EX does have a big footprint with a larger space requirement, its large scale allows more students to engage in a classroom environment that is both flexible and more economical than spending time in a separate facility or on a live-fire range. The Training Lab EX is not just another firing line simulator – it’s the key component to taking your training program and instruction to the next level with efficient, unparalleled realism. For room setup and configuration examples, contact us! Watch What This Simulator Can Do! Financing is available for the Training Lab EX. To learn more about what comes with the system, contact us.